Virender Sehwag became only the second batsman after Sachin Tendulkar to reach the monumental landmark in the limited-over cricket as he raced to maiden double century in just 140 balls. 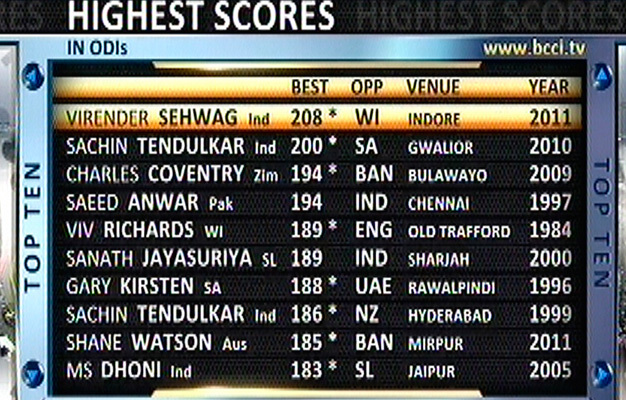 Sehwag surpassed Tendulkar's 200 not out made from 147 balls against South Africa in Gwalior on February 24 last year. The dashing opening batsman made his record double century in 140 balls with the help of 23 fours and six sixes at the jam-packed Holkar Stadium. 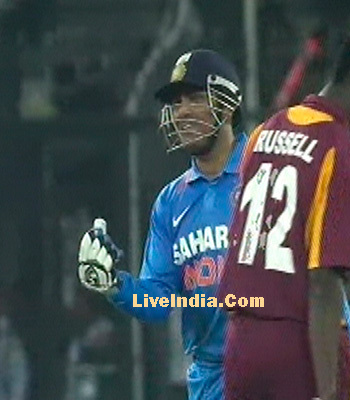 He reached the feat when he square-cut Andre Russell for a boundary in the 44th over of the Indian innings, setting off wild celebrations in the stands and dressing room. He could easily have carried his bat through the innings, but he finally went for another six and ended up holing out to finally get out for 219 in 149 balls, with 25 fours and 7 sixes at a scoring rate of 146.98. Sehwag smashed his way into record books with his stupendous 219, surpassing Tendulkar's 200 not out against South Africa in Gwalior on February 24 last year. This remarkable achievement gives Sehwag the unique distinction of being India's top scorer in both Tests and ODIs. He had scored 319 against South Africa in Chennai in 2008. The dashing opener reached the double century milestone when he square-cut Andre Russell for a boundary in the 44th over of the Indian innings, setting off wild celebrations in the stands and dressing room at the jam-packed Holkar Stadium.